The recipe is from The Watkins Cook Book (The J. R. Watkins Co.) circa 1940 and is the only cookbook that my Mom ever owned. The recipes from that era are very brief with minimal instructions, which is characteristic of cookbooks of that period. I have quite a few in my vintage cookbook collection and I marvel at the brevity of the recipes. Given the precise details of today’s cookbooks, the recipes of that era are a significant departure. For example, oven temperatures were provided in terms of ‘moderate or slow oven’ and baking times were often not provided, primarily because ovens were fuelled by wood or coal and often inconsistent temperature-wise. Every young lady was taught cooking, baking, sewing and other important and necessary life skills from their mothers and their grandmothers. They were expected to master these skills, whether from memory or the cookbooks of the day. During times of war, the rationing of supplies often meant that the lack of ingredients made for some ingenious recipes. 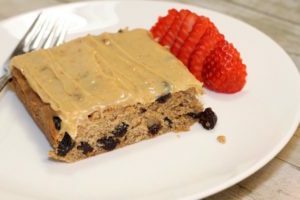 Would you have thought that you could make muffins from leftover oatmeal or a pudding from dry cake crumbs or for that matter, a cake without eggs, butter or milk? These recipes were cleverly developed when times were tough and the pantry was bare. 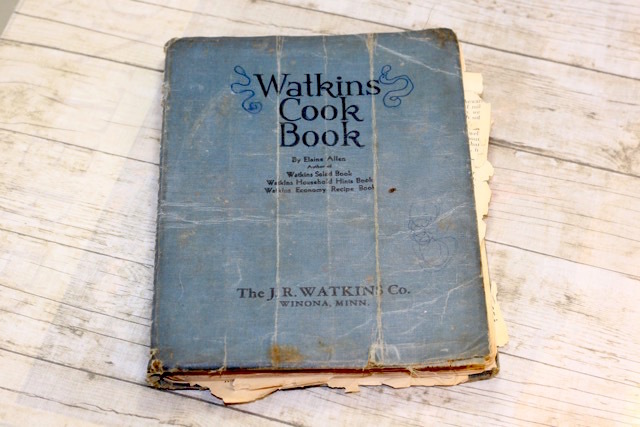 There were sections in the Watkins Cookbook such as Sugar Substitutes; How to Meet the Butter Shortage; How to Save Fuel in Cooking; How to Put Up Fruit; Stretching Meat; Economy Desserts and much more. Housewives were expected to do their part in the war effort by conserving and saving during the rationing – in other words, they wasted nothing! They were affectionately known as ‘housoldiers’ (house soldiers). My Mom even had a little dress made by her Mother from a flour sack. 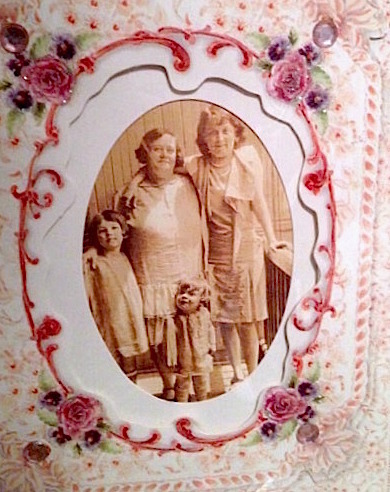 She is the smallest little girl in this photograph (below). Another part of the war effort was the growing of ‘Victory Gardens,’ which were widely encouraged so everyone on the homefront would not go without. Mom remembered that they had a large vegetable garden mainly growing root vegetables that were easy to store. As well, it was not uncommon for families to share a chicken coup in the backyard for eggs and meat, or a cow to two for milk and butter. It is interesting to note that the vintage recipes researched for this article used different terms such as ‘milkless’, ‘eggless’, ‘butterless’, and ‘sugarless’, (unlike today where similar terms are used for the purposes of dietary restrictions) during the war, they were necessary due to shortages. In this post, I utilize the modernized terms; for example: ‘dairy-free’, ‘egg-free’, etc. 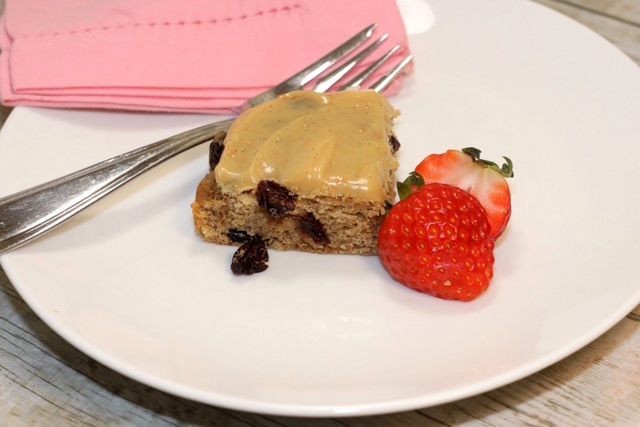 Despite all the unique features of this Vintage Spice Cake recipe, the end result is delicious, moist and easy to make and a great addition to any coffee or tea time offering. CHEF TALK: When working with this vintage recipe, I tried to stay true to the written recipe, adapting it to include more precise temperature and baking time, as well as clarifying the method. Adapt further, if you wish to substitute coconut oil for the lard or try using unrefined sugar such as maple syrup or honey. The cake is lovely with a light dusting of icing sugar. The unfrosted cake also freezes well. Enjoy! Preheat the oven to 350°F (325°F if using convection setting). 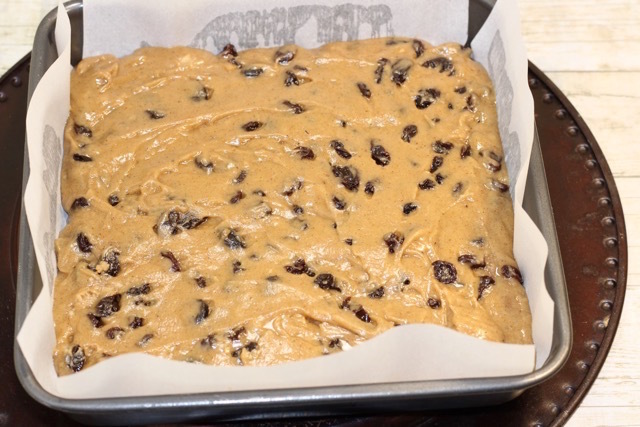 Prepare a 9” x 9” cake pan by greasing it and lining with parchment paper. 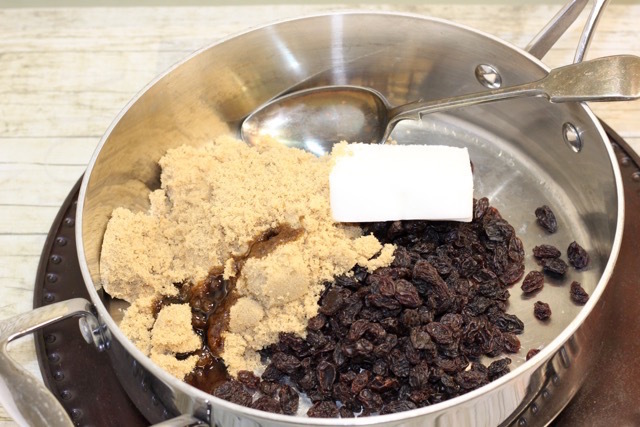 In a small saucepan or low frying pan, boil the sugar, water, lard, and raisins together for about 3 minutes until the sugar is well dissolved. 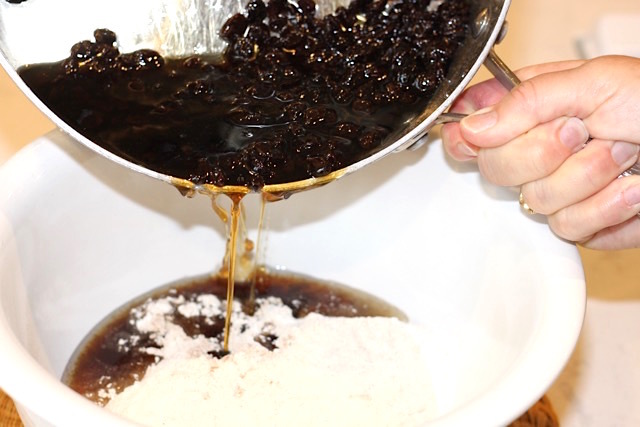 Add vanilla extract to the mixture. Put aside and leave to cool thoroughly. 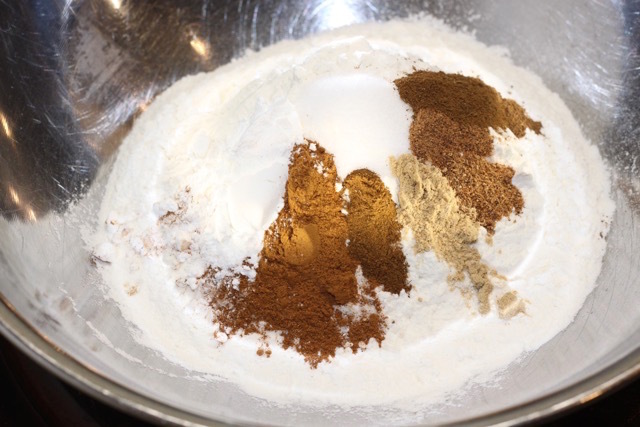 Sift flour, baking powder, salt and spices together. Add to the above-cooled mixture. 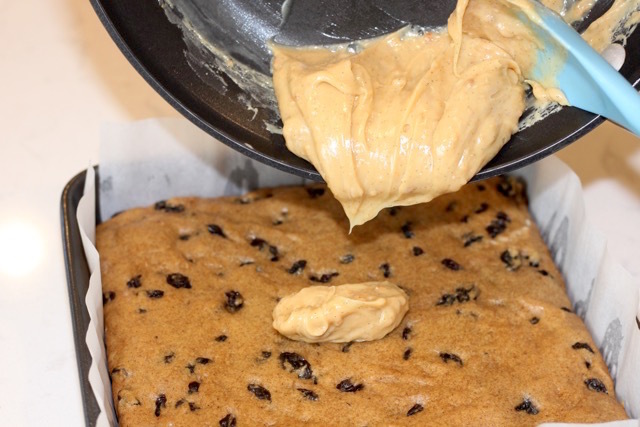 Pour the cake batter into the prepared cake pan. 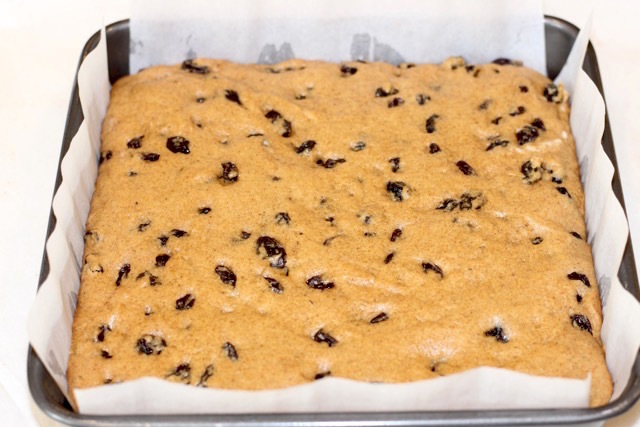 Bake in a moderate oven for 25 minutes or until a thin skewer or toothpick inserted into the center of the cake comes out clean or with a few moist crumbs remaining. Cool the cake on a rack and frost if desired with Toffee Frosting or alternatively, dust with icing sugar. In a shallow frying pan, combine sweetened condensed milk, salt, and lemon juice. 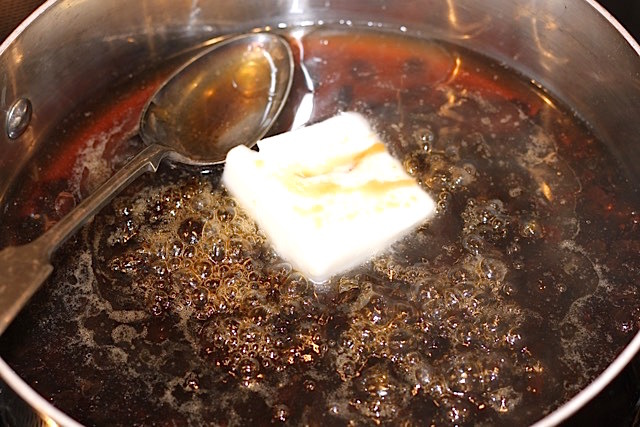 Over medium heat, stir the sweetened condensed milk with a spatula or wooden spoon until it starts to thicken (about two minutes). Add the vanilla extract and hot water. 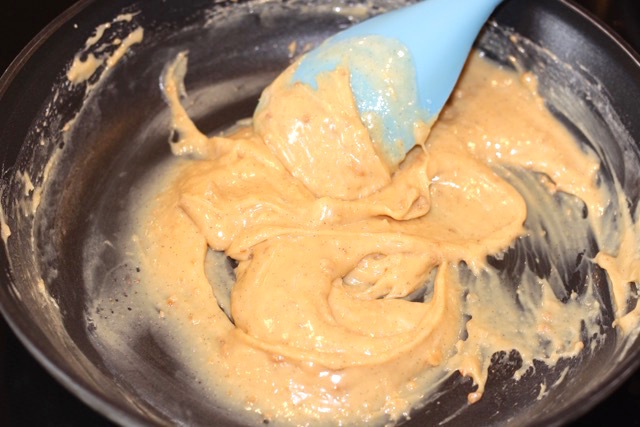 If the mixture is too thick, add a bit more hot water until the frosting is of spreadable consistency. Frost the cake and refrigerate until serving. Cut the cake into 9 snack size or 12 smaller portions. Enjoy with fresh fruit, if available. Cake can also be served without frosting if desired. Dust with a little icing sugar. 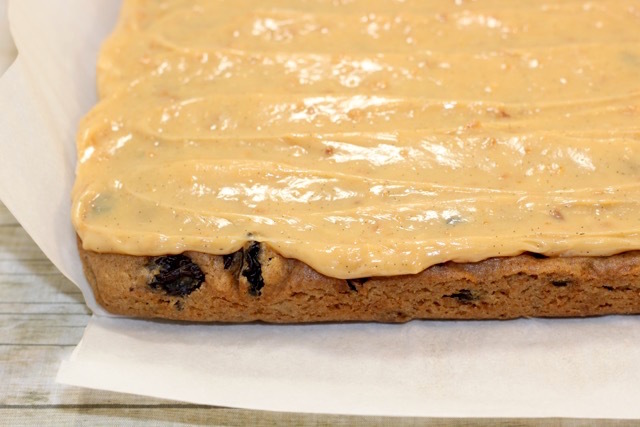 I am sharing a Vintage Spice Cake with Toffee Frosting from a treasured cookbook. 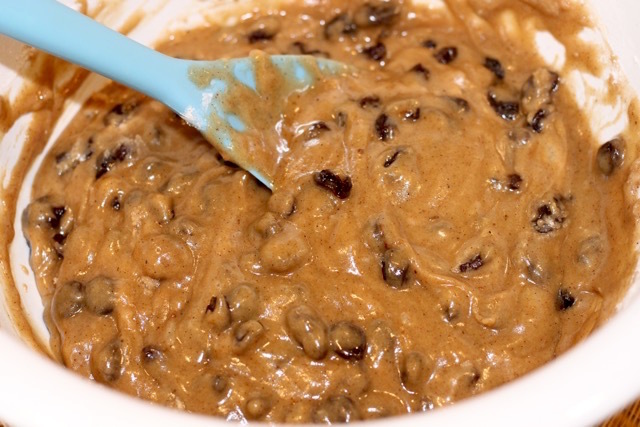 The cake itself is unique in that it does not have eggs, butter, or milk, yet, it is very moist and flavourful due to the use of abundant spices and a mixture of raisins, sugar and boiling water. The fragrance of this cake when baking is unbelievable. It was originally called “The Economy Spice Cake” and you will learn about its history as you read further. 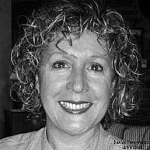 You can find me on social media (see links below). Enjoy! Yes, this Vintage Spice Cake is a lovely cake for gifting, and I have thought about a marzipan layer on top, like fruitcake for that purpose. Thank you for stopping by, Dawn. I have been collecting Vintage cookbooks for years. I love to read them. I find that often you need to adjust because the instructions were not the best. Your cake looks delicious. You are a girl after my own heart, Helene. Reading vintage cookbooks is so thrilling for me – I am always intrigued by the vague descriptions. It is fun for me to figure out what classical culinary method is being used. Thanks so much for your comments. What a beautiful recipe and that old cookbook is something to treasure! I so enjoyed reading about baking in those tough times and learned a lot of things I did not know! I am pretty sure I’d love this cake and its “sugarless” frosting! Thanks for taking us back in time and sharing treasured memories. Thank you so much for your lovely comments, Nicoletta. I am so blessed to now have this treasured cookbook and use it often or just sit and read through the recipes that were our family favourites over the years. It holds so many memories of my Mom with me in her kitchen and now in mine. All the best to you. Have a wonderful weekend. I love old cookbooks and the recipes. I often can find something awesome to make with without having to run to the store. There is something about those old simple recipes I absolutely love. It definitely makes one appreciate that availability of ingredients and the luxury of being able to afford them as compared to our grandparents. My favorite cookbook is an old one I received form my grandmother. She was the best cook & baker I knew and I love that I can cook from the book she learnt form and used often. I just love this post Denise! I love old cook books and this one in particular! Making a recipe from an old cook book is like stepping back in time and being in our grandmothers shoes. It’s fun to bring tradition to the table. Thank you, Christy! I do too – they are very special, aren’t they? I am enjoying this old cookbook so much! 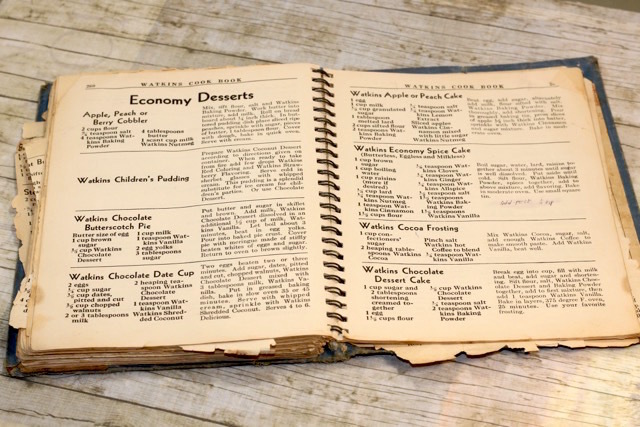 Each of the recipes my Mom made from this book is a precious memory.